The soba noodle is the star at this authentic Japanese restaurant in One Arts Plaza. : The U-shaped bar and discreet tables at this Japanese restaurant from master chef Teiichi Sakurai allow for a Zen dining experience with no distractions from the food and drink. Handmade soba noodles in various incarnations dominate the menu: soba salads, dipping soba (cold and hot) and soba soups --- including a standout duck version with Tokyo onions, tender breast meat and a flavorful broth --- plus a little Italian-Japanese fusion via an unusual soba carbonara. Every table needs an order of the unique and refreshing white seaweed salad. A list of premium sakés is small but well-edited, served in the traditional wooden boxes for sipping, or opt for a pleasantly bitter cocktail of green tea and vodka. Finish the meal with an unexpected, not-too-sweet dessert like nutty soba ice cream drizzled with rich black honey or the understandably popular, silky green tea flan. 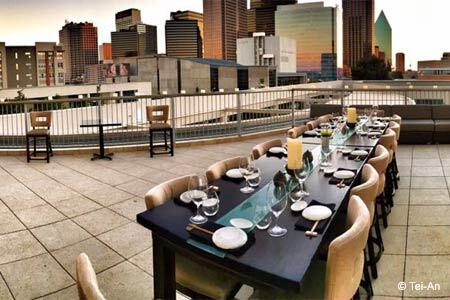 Enjoy city views from the rooftop bar.